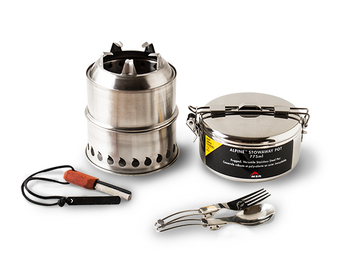 Can be purchased with stove only or extra accessories (with pot, fire starter, and/or collapsible utensil options). Unit is 5 & 1/4" wide, 2 & 3/4" tall collapsed. 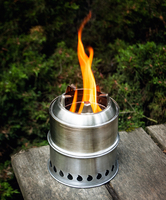 The SilverFire® Scout is a lightweight wood fired gasifier stove, that operates on just on twigs or flammable biomass. It is an ultra compact gasifier design intended for minimalist backpacking or bug out application. 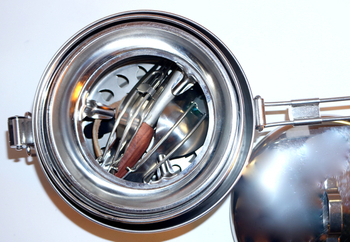 It is designed to be used with small solo sized pots down to 2.5" in diameter or other larger backpack trekking cookware. 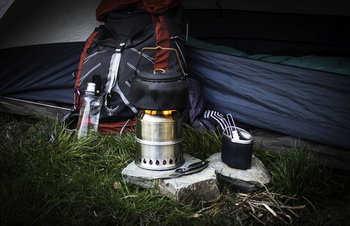 The recommended weight for the Scout is approximately 3 lb / 1.5 Kg small pots. 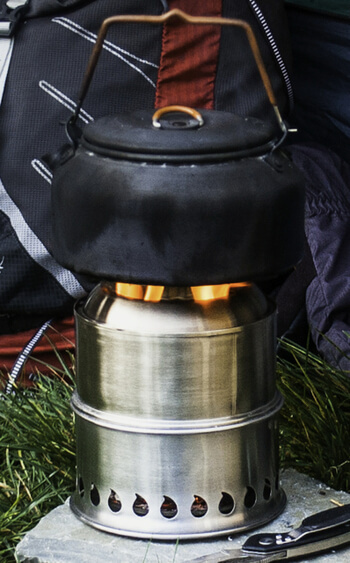 This translates to small cookware designed to heat a quart or liter of water. This stove is not designed for large family cookware, such as our Dragon Pot. 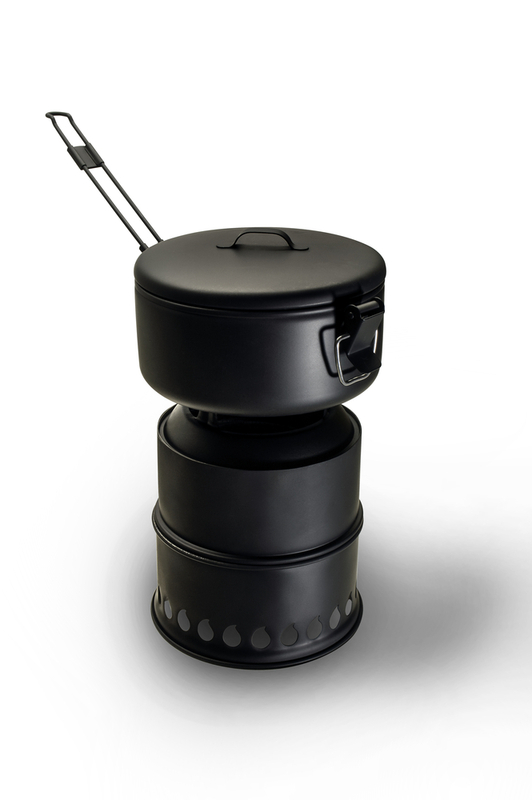 Consider one of our larger portable stove models for family sized meals. 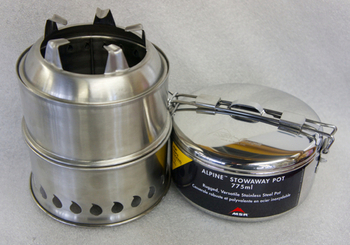 Please see stove accessories for the MSR Alpine Stowaway pot or fire starter combo kit option offered for sale on our website. 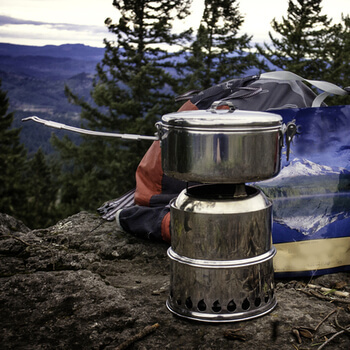 The backpack shown in photo is for combo stove kit size reference and is not included in the sale. 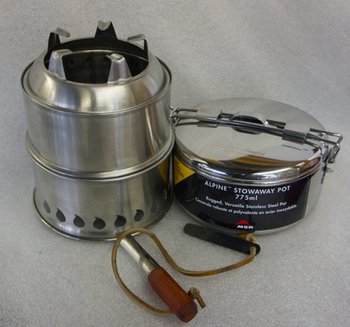 The Scout Stove includes a black nylon bag with drawstring. Dual Scouts Burning with Wood at Night! 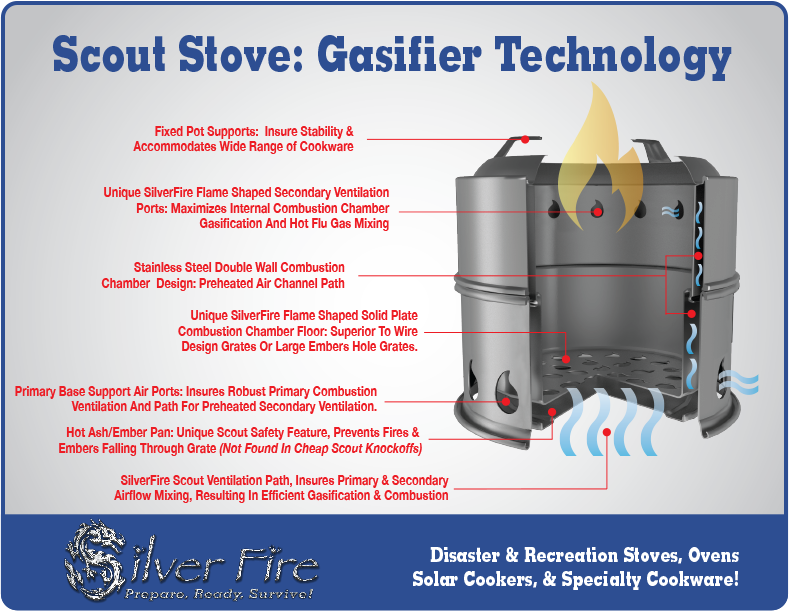 Warning: Buyer's beware, only the SilverFire® Scout has a safety ash / hot ember plate attached below the combustion chamber and flame shaped ventilation holes in our custom patented design. 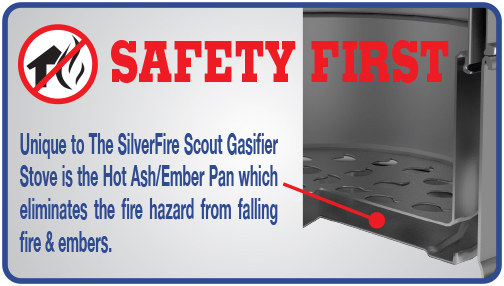 The Internet displays numerous cheap Scout knockoffs, that do not include our ash plate design, which is a huge safety liability and may result in igniting a fire outside the stove! These knockoff stoves are easily identified by round or square shaped ventilation holes, and do not exhibit our SilverFire flame shape motif! We our receiving reports from owners of stoves with wire grates that snapping and failing in the field when fuel is inserted into the combustion chambers or during cleaning. Fortunately they have been able to replace their stove with our superior, simple, and more compact design. Our economy Scout is great, but those who want to maximize stability and prefer a higher quality 304 SS may prefer this option. You are only limited by your imagination. 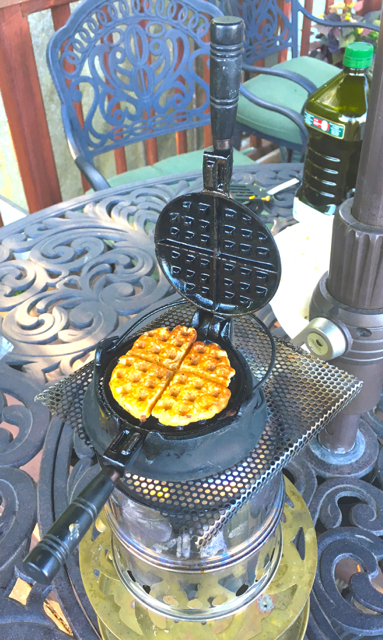 Here is an example of waffles on the Economy Scout below. We found a salesman's 1910 Wagner Cast Iron Sample Wagner Iron. In the 1900's salesmen would carry this miniature sample into department stores to show the buyer the new model that year and take orders. We decided to give it a try. 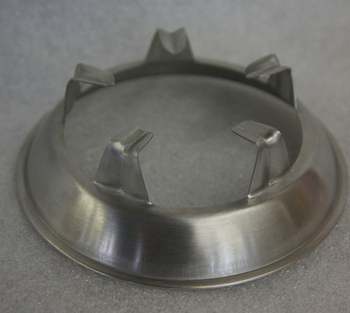 Since the diameter was small we use a piece of flat perforated stainless to support the cast iron waffle base. It worked great! 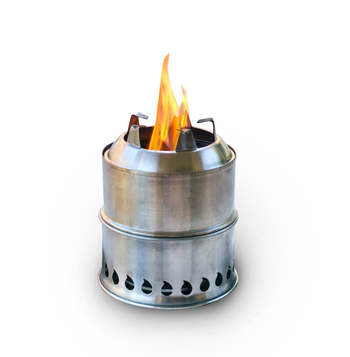 SilverFire® Scout Specifications: Stove Height Assembled: 6 & 3/4 inches tall Diameter: 5 & 1/4 Inches Collapsed: 5 & 1/4" wide, 2 & 3/4" tall. 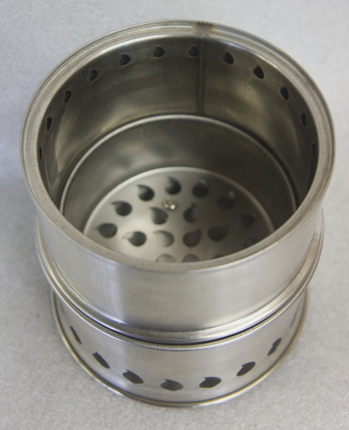 Weight: 12 Oz Construction: All stainless steel Combustion Design: TLUD *TLUD (Top Lit Up Draft) stoves are the latest product of extensive laboratory research. 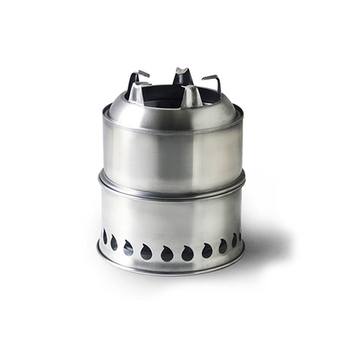 Also known as Wood Gasification Stoves, a well tuned TLUD efficiently mixes hot flu gases with primary and secondary preheated air, resulting in clean combustion. You will be amazed by both the lack of smoke, and the small amount of fine ash left in the ash plate, below the combustion chamber. 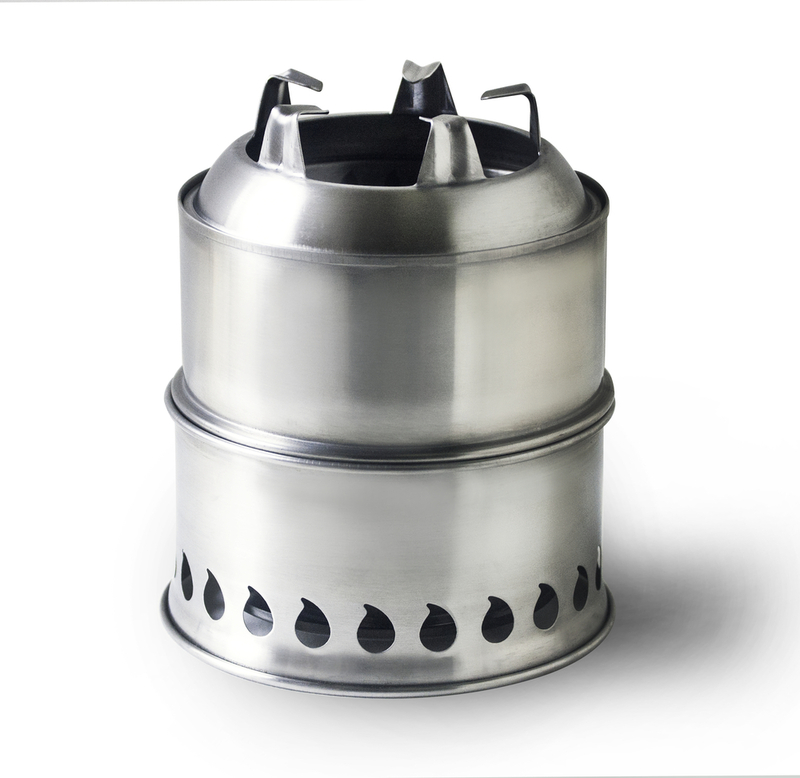 *In the interest of weight, the SilverFire® Scout is a non-insulated type stove. 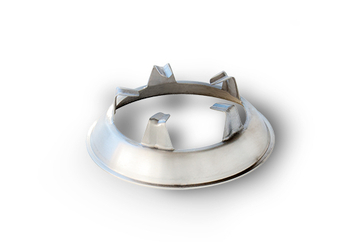 For a stove that remains cooler on the outside when in use, please see our other fine products. *After combustion the stove remains hot and may contain live embers. Handle with care and bury bio char (ashes & embers) appropriately. *While twigs and flammable biomass can be found in most outdoor locations, SilverFire encourages the highest sensitivity to the environment. Gathering twigs in the wild may not be appropriate, especially at alpine elevations.Warning: The SilverFire® Scout is designed for outdoor use only. All wood and biomass burning stoves produce harmful emissions including carbon monoxide. Do not use in tents or locations that are not well ventilated. 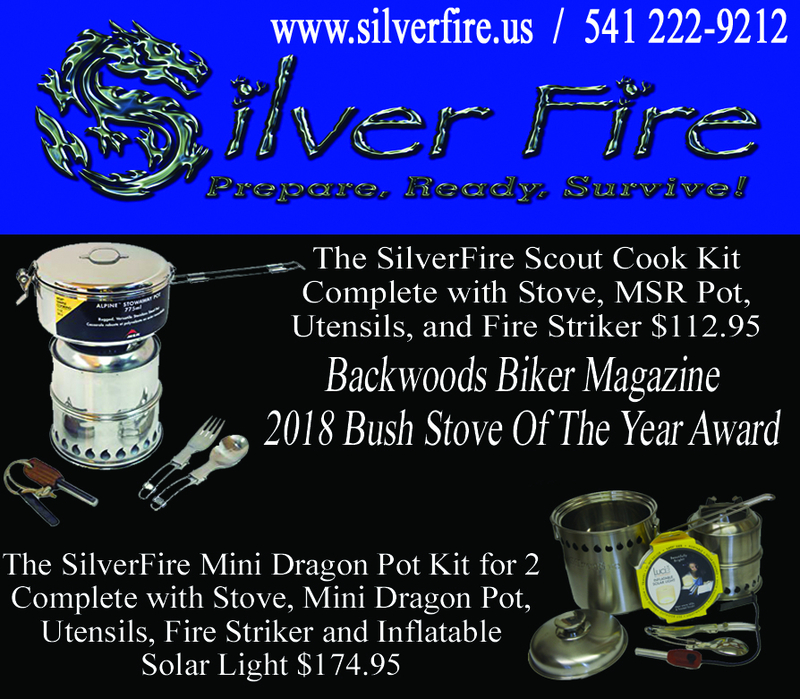 Returned SilverFire products subject to 25% product restocking fee and all shipping costs are non-refundable.The SilverFire® Scout offers quantity discounts for Scout Troops (Brownies & Cubs too!). Quantity lots of 24, 48, 96 units. Please contact us for information for volume orders. Please note many of our important stove and cookware options are found on other tabs on our website, for example - Accessories and Ovens!